What if Godzilla was a projection of your issues? That's the question posed by "Colossal," a new film by Nacho Vigalondo in which an alcoholic screwup named Gloria (Anne Hathaway) unleashes terror on Seoul, South Korea, in the form of a giant monster by getting blackout-drunk. This sounds like the premise of a "Saturday Night Live" sketch blown up to feature length, but part of the weird charm of "Colossal" is its willingness to be that kind of movie to the Nth degree. It warmly embraces the central idea and explores it in detail, without burdening it with gravity that it can't support. Vigalondo, who has carved out a niche making wry, small-scaled, rather peculiar genre films, doesn't do that. This movie feels as if somebody woke from an intense nightmare, decoded it and realized it was rather unsubtly working through some of their unresolved problems, then brought it to Judd Apatow and said, "Here's your next comedy." The story starts in New York City. Gloria's boyfriend (Dan Stevens) breaks up with her after she spends all night out with reprobate friends without notifying him. Dan breaks up with her and kicks her out. There will be no second chances this time: he already packed a suitcase for her. Gloria returns to her hometown in upstate New York, moves into the home that her parents vacated when they moved south after their retirement, and runs into a childhood friend named Oscar (Jason Sudeikis), who owns a local bar, a perfect place to get a job if you're an alcoholic who doesn't have two nickels to rub together. After a long night drinking at the bar with Oscar and his friends Joel (Austin Stowell) and Garth (Tim Blake Nelson), she stumbles home and wakes up to hear that a gigantic creature has attacked Seoul. 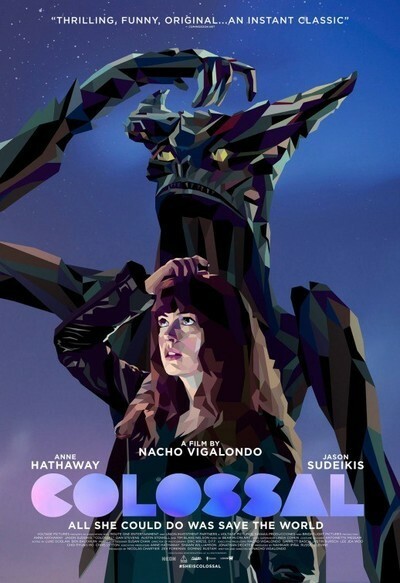 "Colossal" doesn't send Gloria on a time-wasting journey to figure out if there's any connection between her issues and the creature's rampage; instead, it spends its energy asking what such a discovery might mean to Gloria personally and how it relates to her train wreck of a personal life. I should pause here and allow that to enjoy this film, you have to accept that it unfolds in a space somewhere between dream/allegory and realistic psychological comedy and that it's never going to treat the rampage as anything other than a representation of Gloria's problems. Imagine a relatively laid back, small-scaled indie comedy about a woman coming to terms with the mess she's made of her life, but with her demons represented by a kaiju that looks like something out of an older "Godzilla" movie. Part of the film's unique sense of humor comes from the way it plays against our expectation that Vigalondo is going to make things bigger at some point. He never does. The film takes the characters' problems seriously, but it never becomes self-important. There is property damage and a body count on the other side of the world, and this gives Gloria an urgent reason to convince her friends that what she believes is happening is, in fact, happening, and take a long look at herself and urge her fellow barflies, who aren't exactly temperate individuals, to do the same. Hathaway is quite appealing here, striking the right note between desperation and "whatever, dude" haplessness. Her performance has a Diane Keaton-ish quality. Vigalondo's screenplay and her acting do a terrific job of shaping Gloria as the kind of person you may have known, or perhaps been, at some point. She's clever enough and good looking enough to get other people, particularly men, to forgive her tendency to make messes and take advantage, but only up to a point. She's a user of both intoxicants and other people, and she knows it. She also knows that unless she gets a handle on things, she going to keep re-enacting the same cycle until she's either dead or an old lady who lives in a tiny rented bedroom somewhere and spends most of her monthly Social Security check on booze. My only major complaint—and I'm not sure it's even a valid one, considering that "Colossal" never seems that interested in addressing it—is that the movie has a political and racial dimension that it doesn't really explore because it's so focused on Gloria and her pals: it's a movie about comfortable Americans who project their personal turmoil on another culture without giving their wanton destructiveness a second thought. There's a more multilayered and rich genre film somewhere in that notion, and I can imagine a filmmaker like Guillermo del Toro ("Pan's Labyrinth") or George Romero ("Dawn of the Dead") or John Carpenter ("They Live") dealing with it directly. My only minor complaint is that, even though it's short, it still feels a bit slight, its evident modesty notwithstanding. But just when you think you've gotten everything that the premise can give you, "Colossal" takes things in a slightly different direction than you expected. I don't want to say much more about the rest of the plot, because it takes surprising turns. I'll just say that the cast is quietly superb, that the movie always knows what it is and what it wants to say. If you go into "Colossal" expecting another "Pacific Rim" or "Kong: Skull Island," you will emerge less than two hours later puzzled or perhaps angry at what you just saw. Everybody has issues. Maybe we should be grateful that they don't have giant footprints.